The garden has had much extra attention of late. Following on from opening for NGS, we had a royal visit from our Patron, HRH The Prince of Wales on 26th July. 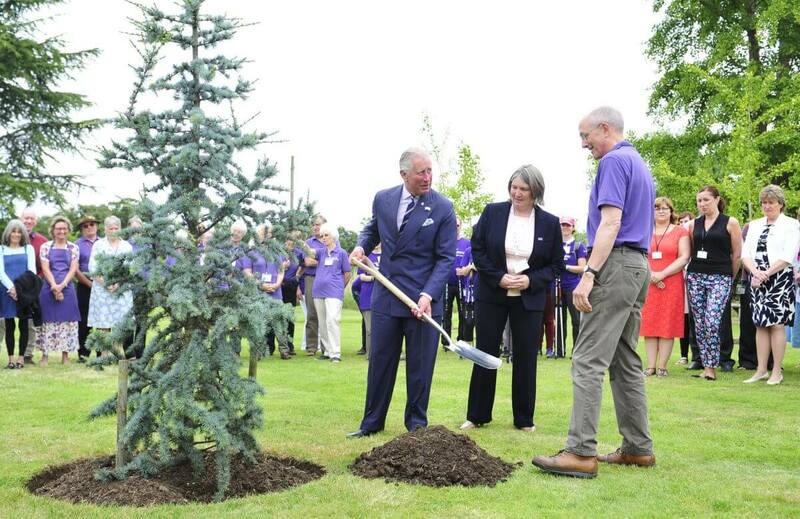 HRH helped to plant a young Atlantic Blue Cedar to maintain development of the garden, following the recent loss of a couple of very mature trees at the end of their lives. A letter from HRH’s private secretary to the Centre says he particularly enjoyed seeing the “transformation of the gardens”, which were described as “stunning” and meeting the garden volunteers. To the Chair of Penny Brohn UK Trustees, Francesca Barnes, has also said the garden looked particularly verdant and plentiful. The team are now back to the usual one gardening session a week, following weeks of intensive twice a week gardening to ensure the grounds were looking as good as possible. We now turn our thoughts to preparing the garden for Autumn and planning ahead to provide colour and texture all year round.